Luckett delivering opening remarks at the 20/20 exhibition Gallery Conversations event in partnership with By Any Means, August 3, 2017. Courtesy of the Carnegie Museum of Art. Luckett works to establish meaningful connections in Pittsburgh and beyond and frequently looks to other cities to translate how cultural institutions in her adoptive city can better reflect the diversity that actually exists. In our first interview of the new year, Luckett talks over what 2018 will bring—including a new book and nonprofit. Sarah Grossman: Did you ever think about other career paths that weren’t in the fields of art or art history? Kilolo Luckett: My mother told me that I was a very curious child, invariably asking questions. I've always looked at unconventional ways of connecting people. I loved peddling my friends’ work. You have a “lemonade stand,” and I used it as a platform to sell artwork made by my friends. There was something freeing about being a kid drawing, coloring, making work that family members would put on the fridge and throughout the home. And then around middle school a shift happened—this sharing and display of artwork went away. There is a moment growing up when you start doing other things, and art becomes less valued, but for me, the desire to share and create stayed. I’m curious about the moment you decided to organize BAM. I was sick and tired of going to art events and seeing only white artists. Early on in my professional career, I was the curatorial assistant at Wood Street Galleries, which at the time mostly featured artwork by European artists, with the exception of Chinese-born artist Xu Bing. I observed during my tenure there that the leadership wasn’t holding the curator accountable to ensure that exhibition programming included broader representation. I looked at the decision-making as lazy. It was, "I'm going to keep doing what I do because it's the easy thing to do." Museum curators and directors in Pittsburgh frequently travel to New York and the majority have never been to the Studio Museum in Harlem, the Museum of Contemporary African Diasporan Arts (MoCADA), or the Schomburg Center for Research in Black Culture. You can't call yourself a curator or director if you organize exhibitions representing exclusively Western perspectives and only go to cultural institutions like the Metropolitan Museum of Art, the Guggenheim Museum, or the Museum of Modern Art. I have never seen a Black curator or director in the mainstream museums in Pittsburgh. Why should Black curators only exist in places like the August Wilson Center? I look at other cities and see change happening, but in Pittsburgh there is a big void. I’ve watched institutions here make excuses as to why leadership is very white; I wasn’t going to wait any longer for somebody to do it, so in 2016 I launched By Any Means. 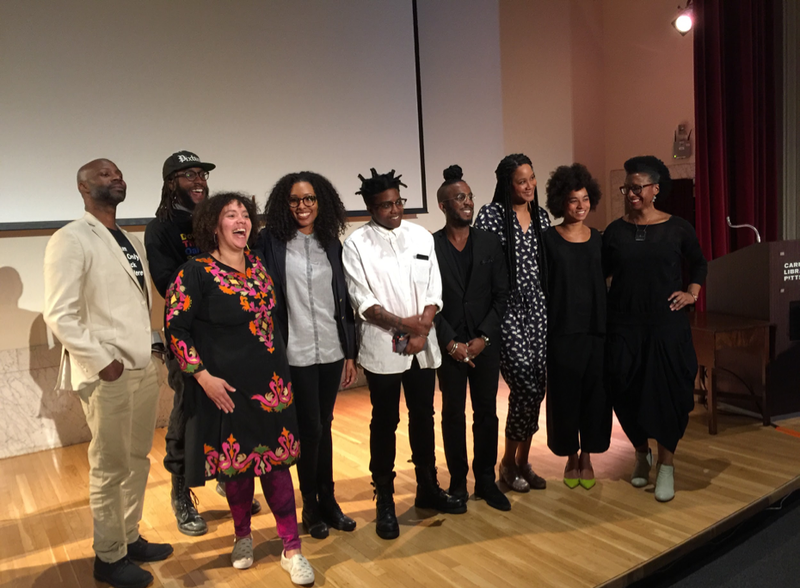 The first By Any Means symposium, Carnegie Library Lecture Hall, April 23, 2016. Left to right: Nathaniel Donnett, Alisha Wormsley, D.S. Kinsel, Taylor Renee Aldridge, Tiona Nekkia McClodden, Ikechukwu Casmir, Jessica Lynne, Rujeko Hockley, and Kilolo Luckett. Courtesy of Kilolo Luckett. For the first event, I brought Black curators, art critics, and nationally recognized Black artists to Pittsburgh for an immersive three-day cultural experience: a day-long symposium, artist studio visits and tours, and conversations with directors and curators from Pittsburgh’s leading museums. The whole series was free and open to the public so people could learn about the work happening outside of the city. There's also emerged a pattern of art museums doing one-off exhibitions and programming. Institutions here need to move away from, “We're going to do a big show about ‘Black art,’ do outreach to Black people, get foundations to give us money, and then pat ourselves on the back.” This needs to stop. Museum change and growth has to happen within an institution, starting at the top. I take my nieces and nephews to museums and the majority of Black people they see are security guards, custodians, or café workers. This reinforces the idea that Black people are relegated to positions of servitude and that leadership positions are reserved for white people. BAM presents narratives counter to this cultural hierarchy that undermines and negatively impacts all of us. We’ve all been programmed using a colonial mindset to think and act a certain way, and the work that I do de-centers whiteness as a superior construct. Luckett (middle) with 20/20 curators, Amanda Hunt (left) of the Studio Museum in Harlem and Eric Crosby (right) of the Carnegie Museum of Art. Courtesy of Kilolo Luckett. You are an inspirational figure—in Pittsburgh and beyond—but who inspires you? There are so many people. Thaddeus Mosley inspires me. He's a sculptor, 91 years old, and his work, Georgia Gate, was in the exhibition 20/20 this fall at the CMoA. Thaddeus was one of the BAM presenters, and it was the first time he spoke about Georgia Gate while it was on view. To give you some context, the CMoA purchased Georgia Gate in 1976. Another local person who inspires me is Dr. Augustus Brown. He is the first African American to have obtained a PhD in art history at the University of Pittsburgh. He later attended Carnegie Mellon University as a fine arts student and went on to pursue his PhD in art and architecture. Dr. Brown knows several artists in the 20/20 show from when he lived in Harlem and worked at the Schomburg Center. Tina Brewer, a superb fiber artist who lives in Homewood, is another tremendous inspiration to me. There is also Charlotte Ka, a multidisciplinary artist exploring printmaking, painting, and fiber art. In the late ‘60s, Charlotte was a young artist involved in Where We At, a collective of Black women artists in New York, who were prominently featured in the We Wanted a Revolution: Black Radical Women 1965–85 exhibition at the Brooklyn Museum. Charlotte and her partner, Mobutu Reynolds, are opening MOKA, a gallery in the Hill District. There’s also Naomi Chambers, an impressive painter working mainly in figuration. She and her husband, Darnell Chambers, founded FlowerHouse, an artist collective, gallery, and social engagement space in Wilkinsburg. Thaddeus Mosley presenting at the 20/20 exhibition Gallery Conversations event in partnership with By Any Means. August 3, 2017. Courtesy of the Carnegie Museum of Art. You're also working on a book about Naomi Sims, who grew up in Pittsburgh. What has inspired you to write this book now? I’ve always been fascinated with people's lives and stories, especially those working outside conventional standards. Naomi Sims was one of the first Black supermodels, who at the height of her modeling career walked away from it to pursue writing and entrepreneurship. She was a dark-skinned woman from Oxford, Mississippi who grew up in very modest circumstances in Pittsburgh and broke the color barrier as a top model, appearing in Vogue and Bazaar. Naomi defied the Western aesthetic of beauty as the standard. She was extremely smart. As a kid, I grew up reading Ebony and Jet and saw pictures of her in lifestyle and fashion magazines that my mother kept. Back in the day, when a Black model graced the cover of a mainstream magazine, that was a big deal. It wasn't until a few years ago that I learned she wrote four books and founded and ran a successful cosmetic and wig company. I realized no one was telling her story, and I needed to do it. In my research, I found out that her former husband, Michael Findlay, a prominent art dealer, worked at a major gallery in New York. I cold-called him at his gallery, thinking, “What do I have to lose?” I called on a Friday afternoon, the worst time to call, but managed to speak with him, and it was surreal. Two weeks later, I was sitting in Findlay’s office interviewing him. Whatever I said piqued his interest enough to talk to me. He was the one who actually encouraged me to write a book. Naomi Sims with Dr. Herman Reed and Alfred Morris at a NEED annual dinner, Pittsburgh, 1965. Photo by Charles Teenie Harris, courtesy of Historic Pittsburgh. Naomi was close to some very influential artists—like Andy Warhol, Ray Johnson, Berry Berenson, Elsa Peretti, and Billy Sullivan. She was a complex and private person who battled cancer and mental illness in silence. Unfortunately, I never had the opportunity to meet her because she passed away from cancer in 2009, which was before I began this work. What are some of the challenges you’ve run into in your research on Sims? Carving out time and raising funds remain two of my biggest challenges. I’ve unearthed a great deal of details, including firsthand accounts from people she personally and professionally knew. I created a Naomi Sims database that includes magazines, photographs, correspondences, interviews, and documents to keep track of it all. I gave my first official talk about Naomi two summers ago at the Carnegie Music Hall here in Pittsburgh. Just getting to that point was pretty difficult for me. I had a hard time selecting what to cover in my talk and basically had an emotional meltdown over the amount of content. I arranged my lecture thematically and explored different areas of her life, and needless to say it went really well! Luckett and Pat Cleveland, former supermodel and mentee of Naomi Sims, New York, May 2013. Courtesy of Paul von Ravenstein. Much of what you do is very focused on marketing, not just for yourself and your work but marketing other people and their work. What is the best way to support artists and administrators of color in the profession? In terms of marketing the Black artistic community, I think there is much room for improvement and growth. There are a lot of initiatives that have started, but many of those initiatives have been run by white people; once again, they do a poor job of building relationships with artists and art administrators of color. Assumptions are made about us instead of getting to know us. I advocate doing studio visits, even if the artist is working out of their home; invite artists and administrators to your events and support them at their events, and not only during Black History Month. These basic things lead to a healthy, robust, multifarious arts ecology for everyone. What are you looking forward to in 2018? Any thoughts or new ventures you’d like to share? I'm starting my own nonprofit! I’ve always had fiscal agents in the work that I’ve produced, so I'm in the process of officially becoming a nonprofit, to be named Alma Lewis after two of my favorite artists—Alma Thomas and Norman Lewis. They were two seminal but under-recognized artists from the early- to mid-20th century. They were abstract artists and contemporaries of Jackson Pollock, Mark Rothko, Lee Krasner, and Robert Motherwell. In 1972, Thomas was the first African American woman to have a solo show at the Whitney Museum of American Art. Lewis became the first Black artist to win the top prize at the Carnegie International in 1955. The mission of Alma Lewis is to serve as an experimental, contemporary art platform for critical thinking, dialogue, and creative expression dedicated to Black culture. Thaddeus Mosley By Any Means studio visit, April 23, 2016. Left to right: Rujeko Hockley, Taylor Renee Aldridge, Thaddeus Mosley, Jessica Lynne, Nathaniel Donnett, Kilolo Luckett, Tiona Nekkia McClodden, Charlotte Ka, and Ikechukwu Casmir. Courtesy of Kilolo Luckett.